While the original inventor of the wheelchair remains largely unknown, the first registered case of what was once known as an “invalid’s wheelchair” was used by Phillip II of Spain in 1595. While a wide range of different wheelchair designs and types were invented over the next 400 years, the folding wheelchair that we are most familiar with today in the Western world was invented in 1932 by Engineer Henry Jennings. The company Everest & Jennings, which was started by the same Jennings that invented the folding wheelchair, was also responsible for the first mass production of the electric wheelchair in 1956. Wheelchairs have gone through many different stages and design options to help assist individuals with limited to no mobility, such as individuals who suffered from total paralysis due to severe cases of polio during the 1940s-1950s epidemic. Today’s wheelchairs are much more refined and offer a wider range of options for individuals with limited mobility. From manually-operated wheelchairs, that can be moved using either the feet or the hands, to electric wheelchairs that can be controlled using only the individual’s mind (though these are in the early development stages), the development of the wheelchair over the years has allowed individuals with limited mobility to continue on with daily activities without having to rely entirely on another individual to move around. Here are some of the different types of manual and electric wheelchairs, and what they can be used for. Manual wheelchairs are operated by either the patient’s arms or legs, or by another individual who pushes the wheelchair from behind. Many forms of manual wheelchairs come in a foldable form to allow for easy transportation on flights and car rides. Light or transfer wheelchairs (see our review of the best lightweight transport wheelchairs) are specifically made to help an individual from one area to another, and are most commonly found in hospital settings or in vehicles where an individual may need to transfer from their seat to an electric wheelchair or power chair. 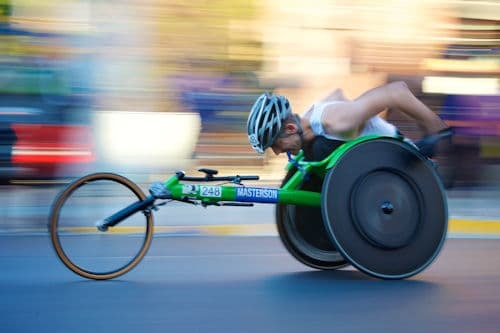 Manual sports wheelchairs are specially designed to allow the athlete using them full range of motion and movement, as well as allowing them added power behind their stroke so they can move quickly to intercept things like baseballs, basketballs ,or to participate in ballroom dancing. Bariatric wheelchairs are specifically made to help individuals who may weigh upwards of 700 lbs to be transferred from one area to another, and come installed with various comfort features, such as a reclining backrest to help distribute the individual’s weight while they are transferred from one area to another. These wheelchairs are most often used in medical settings, or at home for the individuals themselves. Manual wheelchairs are most often used by individuals who still have some form of control over their upper body, or those who have movement available in their legs, but cannot take the full weight of their body due to a spinal injury or other form of physical impairment. While manual wheelchairs can help individuals regain some of their autonomy, for some individuals, such as patients suffering from near-total paralysis, a manual wheelchair is not a viable option, as it would require a caregiver to be nearby at all times. Electric wheelchairs can be controlled using a joystick or other form of control mechanism near the hands of the individual who is using the wheelchair. These wheelchairs are specially designed to allow their user to operate on a wide variety of terrains, and come equipped with a backup battery to allow them to operate without a need for a cord, as well as to allow them to go much longer between instances of charging. Electric wheelchairs are ideal for patients who have limited to no mobility, as it allows them to move around without the assistance of another individual. Cutting edge technology is currently developing a form of wheelchair that operates entirely off of brain signals. While this form electric wheelchair is still in the development stages, the individual who uses the wheelchair undergoes surgery to have sensors placed within the brain, known as the BrainGate System, which allows for an individual who has lost control of their limbs to continue to operate electric wheelchair using only their thoughts. While this form of electric wheelchair is still in clinical trials, it holds the potential to allow individuals who have been nearly fully paralyzed to regain their autonomy and movement, allowing them to move around without having to depend entirely on their caregiver. Modern-day wheelchairs come in a wide range of styles, designs, and functions to allow the individual with limited to no mobility to regain some of their autonomy, and allow them to go about their lives without having to depend entirely on another person for transportation. Manual wheelchairs have evolved drastically from the early uncomfortable chairs of the 16th century to the more lightweight, manageable designs we see today. Electric wheelchairs have become more advanced, and allow the individual who operates them to move around safely and confidently without having to depend on physical momentum to get around. And, while it is still in development, soon we may see a day when wheelchairs can be operated using nothing but brainpower, to allow individuals who have been totally paralyzed to move around freely again.